Acquisitions, Joint Ventures, New Hub Strategies - all developments which seem these days to be the main priority of the Gulf carriers. In this respect, Qatar Airways is on the same route as their nearby rivals, Emirates and Etihad. It is amazing how far the Doha-based national carrier of Qatar has come since it commenced operations in January 1994. It now operates a fleet of around 185 aircraft with almost a further 190 on order, some of which will replace aging B777s which were acquired some years ago. Qatar also has an impressive regional passenger fleet of 50 or so aircraft made up from Airbus A320/321 models. The long haul fleet however, is the backbone of the company and offers an impressive belly hold tonnage to customers worldwide. When looking at Qatar’s companions in the “oneworld” alliance it is easy to spot that Qatar ranks fourth in terms of fleet composition behind American, British Airways and Cathay Pacific. This may change in the future if Cathay were to consider moving over into the Star Alliance camp. 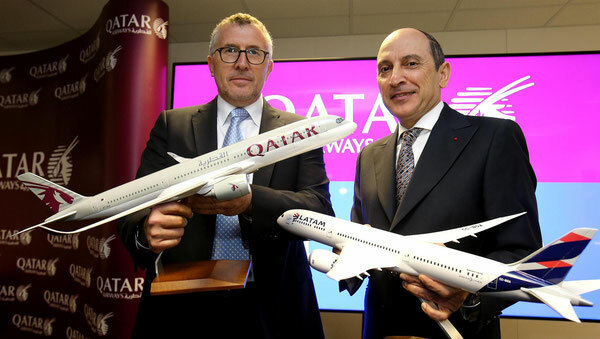 Akbar Al Baker, Qatar Airways CEO makes no secret of the fact that the Doha-based airline will continue on its road to further investment. This was shown last week when he announced that QR will take a 49% holding in Italian regional carrier Meridiana which is Italy’s second largest carrier with an impressive network within Italy and Europe. A thorn in the side of QR’s competitor, Etihad Airways which with its holding in Alitalia is trying hard to get a foothold in the Italian cargo and passenger market. Al Baker has stated that Qatar is presently looking at many airlines and is seemingly not afraid to invest also in struggling carriers which in his view have good future potential. Quite some parallels to his counterpart Hogan over at Etihad. The 10% stake QR has in British Airways parent company, IAG could well be increased in the near future and Mr Al Baker was said to have made comments that Qatar should maybe consider forming its own group within the oneworld alliance. Is this the first move for a dominant role within the group? Qatar Cargo can now safely boast that they are the world’s third largest international freight carrier. This position has been achieved mainly during the past five to six years with the carrier following a strategy of constant expansion in the air cargo market. The capacity offered to logistics partners cannot be overlooked. The passenger long-haul fleet made up of a mixture of Boeing and Airbus wide bodies operating over an ever expanding network is proof enough. On top of this, the carrier has moved into fixed cargo operations with their fleet of nine B777F and eight A330-200F aircraft along with leasing in two B747Fs from MyCargo. Australia, South America and Transpacific - these are all new areas where Qatar Cargo wishes to expand into. The recent agreement between Qatar Airways and the LATAM Group in South America whereby the Qataris will acquire up to 10 percent of LATAM’s shares, will also surely help the Doha-based carrier to expand faster with its cargo plans in South America. LATAM has been gradually cutting back on all freighter services and QR may well step in to strengthen their presence there. Doha Airport has established itself as a recognized air cargo hub in the Middle East. Qatar Cargo with its growing freighter fleet has needed to look at a workable hub in Europe and chose Belgium’s Liege Airport as its partner. That decision now seems to have changed as reported in this publication that they are seriously considering moving the main European hub into Luxembourg’s Findel Airport. “Moving into the lion’s den” - so to speak. LUX is Cargolux’s home base and it is ironic that Qatar once held a 35% share in Cargolux up until early 2013. The move however, seems to be because Qatar wants to use the 5th Freedom traffic rights granted to them under a 2011 Bilateral Air Services Agreement (BASA) with Luxembourg. But still - a thorn in CV’s skin as QR Cargo is said to want to deploy its B777F fleet on routes out of LUX which mirror those of CV. Luxembourg’s unions are not at all happy with this planned move as they claim that QR Cargo massively undercuts on rates and it will result in a price war. Qatar Airways has for the first time published their annual fiscal results. For fiscal year 2016 which ends in March, the carrier showed a profit of around 746 million euros. In fiscal year 2015 the figure was only 274 million euros. Annual revenues were put at 8.65 billion euros and cargo tonnages at over 1.5 million tonnes. The decision to publish annual figures was said to be in retaliation to claims that Qatar Airways is receiving large subventions from the Qatari state.